writes for us on a recent academic gathering on her side of the pond. Speaking from the side of the history of international development in Canadian foreign policy, Kevin Brushett of the Royal Military College of Canada, in his paper “Swords into Ploughshares: Robert McNamara, Lester Pearson and International Development Assistance to the Global South, 1966 to 1976,” examined the now famous 1969 report, Partners in Development, resulting from the World Bank’s Commission on International Development led by former Prime Minister Pearson. While now standing in the popular mindset as an emblem of Canada’s proud role as an internationally-respected authority on issues of development, Brushett found that this version of history was largely invented in the years after the report was published. Pearson actually encountered a lot of resistance, not only to his own leadership, but to the report itself. My paper, “‘I find this aid field becoming all the time more complicated’: Nik Cavell, Escott Reid, and the struggle over Canadian aid to India, 1952-1957” also represented an example of Canadian foreign policy history, but looked particularly at the history of Canadian foreign assistance to India. I argued that two distinct approaches to Canadian foreign aid to India developed within the Canadian government in the period between 1952 and 1957. Escott Reid, Canada’s high commissioner to India, sought a multilateral approach toward aid that addressed the economic development needs of India, whereas the administrator of the Colombo Plan, Reginald George “Nik” Cavell, lobbied for a “distinctively Canadian” foreign aid program that emphasized Canadian expertise and goods. Although Laura Madokoro’s paper stood out as one that did not specifically address a Canadian topic, her presentation “Humanitarianism and Cold War Politics in Hong Kong” is representative of a progression from studying Canadian refugee history during her doctoral work to extending the topic internationally for her post-doctoral studies at Columbia. Madokoro, who will be starting a position as an Assistant Professor of History & Classical Studies at McGill in the fall, looked at how surveys of refugees in Hong Kong in the early 1950s helped to construct a certain idea about the political nature of Chinese refugees to suit the wider anti-communist goals of funding agencies. Finally, Will Tait’s presentation, “From Miles for Millons to ‘If I had a rocket launcher’? Oxfam Canada’s Cold War and the Role of Religion Traditions” questioned widespread assumptions of a straightforward path toward secularization in post-war NGOs and the field of development more generally. Tait surveyed the tumultuous history of Oxfam Canada from the 1960s to the 1980s. He concluded with important questions about the role of internal colonialism in the French/English divide of Oxfam Canada, and the radical politicization of the NGO even as it maintained relationships with mainstream Canadian churches. The presentations represented a slice of the emerging interest in the history of humanitarianism, NGOs, foreign aid, and Canadian international development in the past few years. In some cases, this has grown naturally out of established fields of social history, such as religious historian Ruth Compton-Brouwer’s research on the history of the Canadian University Services Overseas (CUSO), an international development volunteer organization. Like Tait, Compton-Brouwer has found strong linkages between pre-war overseas missionary culture, and post-war, so-called “secular” NGOs in Canada in articles she has recently published. She also has a forthcoming book on CUSO. In other cases, new scholars have found that the history of a discreet topic can spin out into a number of fields. Sarah Glassford’s dissertation on the history of the Canadian Red Cross has proved fertile ground for investigating a host of diverse subjects, such as youth, gender and even military history. Interest in the history of international development has also emerged naturally out of a more general interest in Canadian foreign policy history. The history of Canadian foreign aid has received some attention, such as David Morrion’s 1998 landmark book on the history of the Canadian International Development Agency, Aid and Ebb Tide: A History of CIDA and Canadian Development Assistance. However, making connections between the pragmatic concerns of government and the social concerns of humanitarianism can prove to be a difficult challenge when so much of Canada’s foreign aid has been tied to commercial and foreign policy goals. Bruce Muirhead and Ron Harpelle’s 2010 book IDRC: 40 Years of Ideas, Innovation, and Impact documents the history of the International Development Research Centre, one bright point in the Canadian government’s work in the field of development in the Global South. In the popular imagination of Canadians, volunteerism, humanitarianism, generosity, foreign aid, and international development are all linked concepts that contribute universally to our otherwise undecided national identity. Particularly since the era of Prime Minister Lester Pearson, successive governments, both Conservative and Liberal, have all claimed the mantle of the Canadian global helpmate. Even our most recent Conservative government has used its association with small-c conservative values to target its aid toward supporting international child and maternal health. While historians view these issues with a much more critical eye, an interest in the subject itself is an outgrowth of this national preoccupation. Yet the links between politics, policy, and civil society are not always apparent. Much more remains to be explored, and if historians can find a way to connect political and social histories, a lot more can be accomplished. 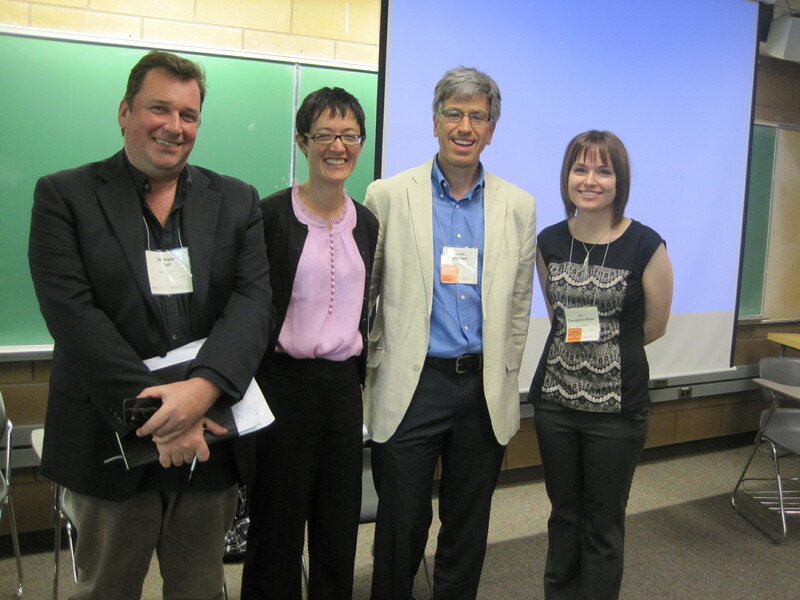 Hopefully this intellectual conversation can continue throughout the coming year, and also at next year’s CHA at Brock University in St. Catharine’s, Ontario. This entry was posted in Conferences, Events, Research and tagged Canada, humanitarianism, transnational histories, voluntary sector. Bookmark the permalink.